PIKE-PERCH CHEEKS (Sander lucioperca) are the most delicate and delicious part of the fish. The cheeks are easy to prepare – sautee` with butter and lemon or oven bake until white and flaky or coat with your special breading recipe and deep fry until golden brown. 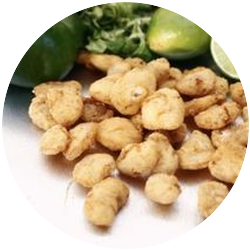 The product makes an excellent appetizer, fish and chips basket, or can be used as a great addition to any seafood dinner plate (seafood pasta alfredo). 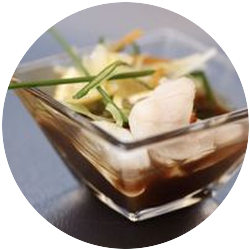 Pike-perch cheeks are also great for making a tasty seafood chowder. Kids enjoy this healthy and yummy product as a great alternative to chicken nuggets. The cheek sizes vary depending on the size of the fish they were harvested from, but an average cheek weighs about .3-.4 ounces. 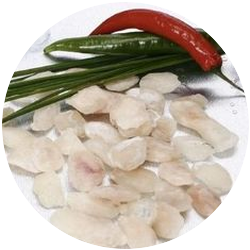 The product is available as non-breaded or breaded pike-perch cheeks.